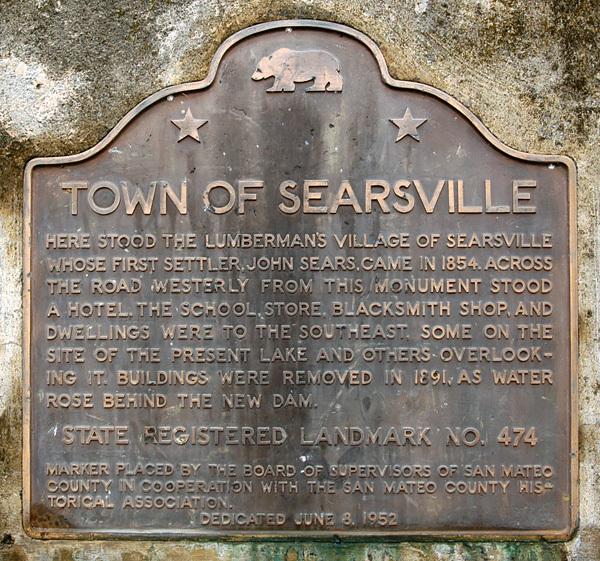 Here stood the lumbermen's village of Searsville whose first settler, John Sears, came in 1854. Across the road westerly from this monument stood a hotel. The school, store, blacksmith shop, and dwellings were to the southeast, some on the site of the present lake and others overlooking it. Buildings were removed in 1891, as water rose behind the new dam. Plaque placed by the Board of Supervisors of San Mateo County in cooperation with the San Mateo County Historical Association.